Daughter of the Raj who used her experience of life in the Empire to create her romantic bestseller The Far Pavilions. THE TIMES, Saturday, January 31, 2004. Page 51, Obituaries. A daughter of the Raj, born in Simla in the years before the First World War, M M Kaye put her childhood experience and voluminous reading of history to good use in her epic romance of British India in the 19th century, The Far Pavilions, which was published in 1978. The story of a boy, orphaned in childhood, brought up as a Hindu and growing to maturity in the sub-continent before the Indian Mutiny, it became a runaway bestseller and an immensely popular television drama. It was by no means her first novel. She had been writing children’s fiction (as Mollie Kaye) from 1937 onwards, and published several novels with Indian themes in the 1950s and 1960s. She also wrote as Mollie Hamilton, the surname of the army officer whom she married during the war. She had researched the Indian Mutiny meticulously, and detailed of its causes - and the savagery with which it was conducted and then repressed - are the subject matter of several of her books. But it was The Far Pavilions, that defined her as a writer about Indian, and which made her a household name. Before taking up writing, Kaye had been a painter, taking her easel wherever she went on her rambles in India, and making a small income from selling them. She continued to paint throughout her life. In the 1950s, she illustrated a number of children’s books and, much later, did the watercolour for the jacket of the first part of her autobiography. Mary Margaret (Mollie) Kaye was born in India in 1908, the daughter of Sir Cecil Kaye, an Indian civil servant. Her early childhood was one steeped in the ambience of the Raj, something that never really left her. The Delhi of her youth was still the old walled city of the Moguls, and she and her sister, Bets, explored the secret hideaways of its gardens and fished for whitebait under its ramparts. When out with their ayahs she and Bets became adept at persuading these guardians to shop in the bazaar, while they slipped away and chatted to stallholders or listened to story-tellers. But this idyll was soon to come to an end. As their brother had before them, at ten they were to be shipped off to boarding school in England. After a three-day journey by train from Delhi they embarked in a steamer at Bombay for the lengthy passage to London. Mollie was educated at The Lawn School, Clevedon, Somerset. By the time she left, it appeared that her Indian experience was to be closed to her. Her father retired from his Indian service in 1935 and returned home to England to settle with his family. But this could not go on for ever. In 1935 her father died and his daughter, by then 27 but still unmarried, found she could not live on the pittance of a pension allotted to an Indian civil servant’s daughter. She returned to England and from a tiny flat off King’s Road, Chelsea, tried to make an income from selling her pictures of Indian scenes. This scarcely brought her in a realistic income so she tried her hand at writing for children. Fro 1937, as Mollie Kaye, she produced a number of books in the Potter Pinner series, which were attractively illustrated by Margaret Tempest. Among them such titles as Black Bramble Wood and Gold Gorse Common, remained popular reading for very young children for the next 20 years. For Kaye the income generated meant one thing; she was able to return to her beloved India, where she stayed in Simla with her sister, who was by now married. 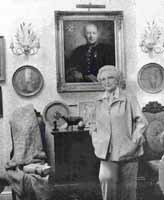 There in 1940, she met and fell in love with an army officer, Goff Hamilton (Later Major-General G J Hamilton), whom she subsequently married. But before that happy eventuality there were many obstacles. Hamilton was married. Nevertheless the couple could not wait for a divorce and embarked on an affair, as a result of which she became pregnant. It was, in the parlance of the time, a “hole-and-corner” affair, with her having to avoid disapproval by constantly visiting mythical girlfriends who lived at suitably long distances, to disguise her condition. She later described delivering her daughter in a small hill station, attended by a “doctor” who turned out to be no more than a (drunk) medical orderly. Halfway through her labour she groggily observed a tiger snatching a domestic water buffalo from beneath her veranda. Eventually Hamilton obtained his divorce and they were married in 1942. She now combined the role of an army officer’s wife (they moved 27 times during their marriage) with authorship. She had already published one detective novel, Six Bars at Seven, in 1940 and she continued in this vein with such titles as Death Walks in Berlin, Death Walks in Cyprus and Later Than You Think (later republished as Death in Kenya) over the next 20 years. All seven of these suspense novels were subsequently reissued with Death in… titles. She also, much later, wrote further books for children: the Ordinary Princess (1980) and Thistledown (1981). The first of Kaye’s historical works was Shadow of the Moon, which appeared in 1957. It embodied the considerable research she had done on the Mutiny, sometimes to the detriment of the love interest which threatened to be submerged in the fearful backdrop. Like its successor, Trade Wind (1963), which was set in Zanzibar (she had been in Kenya with her husband during the Mau Mau insurgency), it was respectfully reviewed, but not in terms that amounted to acclaim. That had to wait until 1978 with the publication of The Far Pavilions, on which she had been working for the previous dozen years. It was futile of some reviewers to complain of its overdone melodrama, and its uncritical acceptance of life under the Raj in terms of the men who ruled it. Paul Scott (of The Raj Quartet fame), who had candidly told her when shown a previous novel: “Mollie, it stinks”, is said to have uttered “Shabash!” )(the war cry of the Guides Cavalry) when he completed the Far Pavilions as a demonstration of his approval. The public voted with its pockets and the book sold millions of copies over the next few years. It became a television miniseries in 1984. A musical version of it is extant and there are plans to produce it. Long before this, in 1967, her husband had retired from the army and they retired to Battle in East Sussex, where she had continued her writing. Three volumes of autobiography: The Sun in the Morning, Golden Afternoon and Enchanted Evening appeared in 1990, 1997 and 1999. Kaye’s husband died in 1985. There were two daughters of the marriage. M. M. Kaye, author, was born on August 21, 1908. She died on January 29, 2004, aged 95.